It is difficult to appreciate the subtle differences between the various types or severities of intervertebral disc injuries that result in them being defined as bulges, herniations, protrusions, extrusions, etc. The way disc pathology is defined may even vary from physician to physician—perhaps primarily due to the fact that, prior to 1995, many physicians’ professional societies used different criteria to define the various classifications of disc injuries.  In 1995, a joint undertaking by representatives from the North American Spine Society, the American Society of Spine Radiology, and the American Society of Neuroradiology worked together to develop a more widely accepted and used system to define disc pathology as published in "Nomenclature and Classification of Lumbar Disc Pathology”. This will be the first of three blogs dedicated to helping explain the definitions of disc pathology as recommended by the 1995 combined task force. This blog will focus on the difference between "bulges" and "herniations". Topics to be discussed in future articles are differences between a "Herniated Disc" and an "Annular Tear" and the difference between "Protrusions" and "Extrusions". 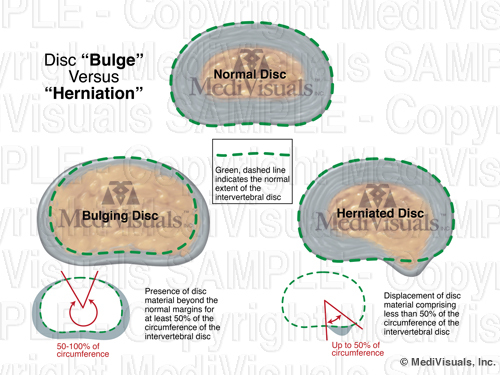 In the image below, a normal disc is shown in comparison to the two types of intervertebral disc injuries covered in this article: "Bulges" and "Herniations". Disc "Bulges", in general, are defined by the presence of disc material beyond the normal margins around at least 50% of the disc's circumference. A "Herniation" is defined as displacement of disc material beyond the limits of the intervertebral disc space that extends less than 50% around the circumference of the disc. The displacement material can consist of the nucleus, the annulus, or parts of both. This is significant in personal injury litigation because the defense often places a great deal of emphasis on whether disc pathology is defined as a "bulge" or "herniation" when determining the severity of an injury. However, a "bulge" can actually impinge nerve roots or the spinal cord to a more severe degree than a "herniation". 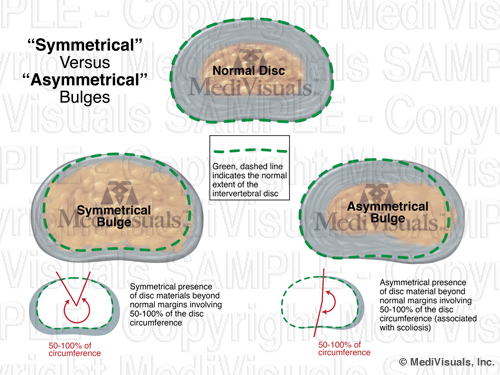 The next image compares the normal disc to two different types of disc "Bulges". A "Bulge" is defined as "Symmetrical" when the right and left sides of the herniation more or less mirror each other. A bulge is "Asymmetrical" when the bulge is more severe on one side when compared to the other. Finally, the below image shows a normal disc as compared to two types of "Herniations". A "Broad-Based" herniation is defined as disc material extending beyond its normal limits in an area between 25 and 50% of the disc's circumference. 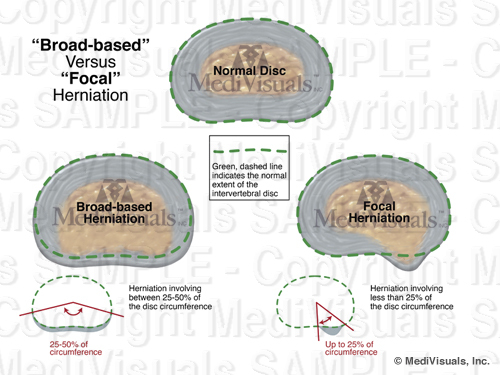 A "Focal" herniation is one involving extension of disc material beyond its normal limits in less than 25% of its circumference.